September | 2014 | We Can't Hear the Mime! For many years now I have noticed “The trainspotting cult”. Unfortunately this is not a cult of violent middle-aged men brandishing perfectly sharpened HB pencils but rather an unavoidable truth that most people who have seen Danny Boyle’s breakout film will extoll it’s virtues to high heaven. I’m not at all sorry to say that I have joined this cult. Trainspotting is a film that stays with you in the best way that a film can, through its imagery. Danny Boyle is a master of the pure visual art. Anyone who remembers his slightly more sentimental Oscar-winner, Slumdog Millionaire, would be hard pushed not to associate the colour yellow with Latika. Trainspotting is a more radical, stylish attack on cinematic preconceptions. Renton’s (Ewan McGregor) drug withdrawal symptoms become a nightmare sequence incorporating purpose-built sets and Hitchcockian camera techniques. While often, in cinema, a voiceover narration shows a weakness in the script or a refusal to trust the audience; for example, the painful shoehorning of a voiceover into Blade Runner, here the voiceover acts to tighten up the script. It doesn’t take on the role of exposition, moral judgement or nostalgia but remains within the mind of Renton to express his reactions to what we’re seeing. It’s a neat ploy, where the audience is seeing squalor and misery he is only seeing his friends and day to day life. In the opening monologue Renton pours disdain on the people who choose to live a normal life, unlike the one he leads among the heroin addicts of Edinburgh. Yet throughout the film’s episodes we see Renton repeatedly try to choose the way out, back into the society he claims to hate. Despite the film’s comic, almost uplifting tone, this group of friends does suffer, terribly. It’s a chilling conclusion that Renton comes to. Choosing to conform will end suffering, but at the price of the greatest highs he’s ever known, heroin and the freedom to choose. In this respect the script packs all the right punches. This isn’t a tragic story of trapped addicts seeking redemption. This is a story of rebellion, anti-capitalist ideals and a cry for self-determination in a corporate world. The soundtrack boils over with 90’s Eurodance music, a genre where even the name screams of a hope of unity and identity. A hope that is undermined by the class barriers Renton finds himself confronted by. When he moves to London a hopeful montage of diversity and prosperity greets him, only for him to end up in even more dire straits than he was before. In the end Renton does choose to conform. As he starts his new life it’s easy to wonder whether he’s really as happy with the new direction he’s taking as he seems or if he, like the people he used to hate, has finally learned to love Big Brother. This entry was posted in Film Reviews, Gold Screen, Personal Screen and tagged British Cinema, Danny Boyle, Ewan McGregor, Film Review, Scotland, Trainspotting on September 16, 2014 by Flo. Seven years the first performance of Plenty, David Hare’s award-winning script was turned into a screenplay to be directed by Fred Schepisi. The story follows Susan (Meryl Streep) over the course of twenty years, starting with her war service in a sleepy French provincial town. Over time her story becomes emblematic of a changing Britain and the struggle to maintain post-war optimism. There’s a cinematic style that seems to hover over adapted screenplays, particularly those written by or adapted by playwrights. Betrayal and A Room with a View are some other examples but Plenty certainly has it. The effect this generally has is a kind of redundancy or, more kindly, double impact in the film. Things that have to be specified on a stage, such as the location of the scenes and even remarks about the weather are visual markers. They would do as well to be left entirely unsaid when a camera can point directly at them. This creates a unique atmosphere of verbosity and overstatement. It seems that these characters are moved within themselves to speak so strongly all of the time despite expressing themselves in other ways. However with such beautiful cinematography and performances it’s certainly hard-hitting in combination. This quirk of script works entirely to Meryl Streep’s advantage. Her portrayal of Susan shows her as a woman on the edge, permanently holding back the floodgates to something. We only glimpse at what she’s keeping hidden inside herself and even then it’s filtered through politics and custom. Streep’s performance is mesmerising, almost charming if she were not playing such a hideously flawed woman. Other characters come and go throughout the film, memorably Charles Dance and Sting as two spurned men caught in Susan’s whirlwind. However Plenty remains at its core an examination of Susan’s psyche. As such it’s difficult to enjoy in a traditional sense. There’s a desire for reconciliation, happiness or even a moment of piece as you’re dragged along on her vindictive, destructive life but it never comes. Despite Streep’s fantastic performance it’s so difficult to connect to Susan that the film loses its emotional thrust about halfway through. While, of course, people are shaped disproportionately by their early experiences it seems that Susan is just searching for reasons to be unhappy. As if her entire life was a performance put on to excuse herself from living. Destructive and self-righteous are not personality traits that make for sympathetic characters, and so, much like Silver Linings Playbook, I found Plenty eventually leaving me cold, despite the sum of its parts. 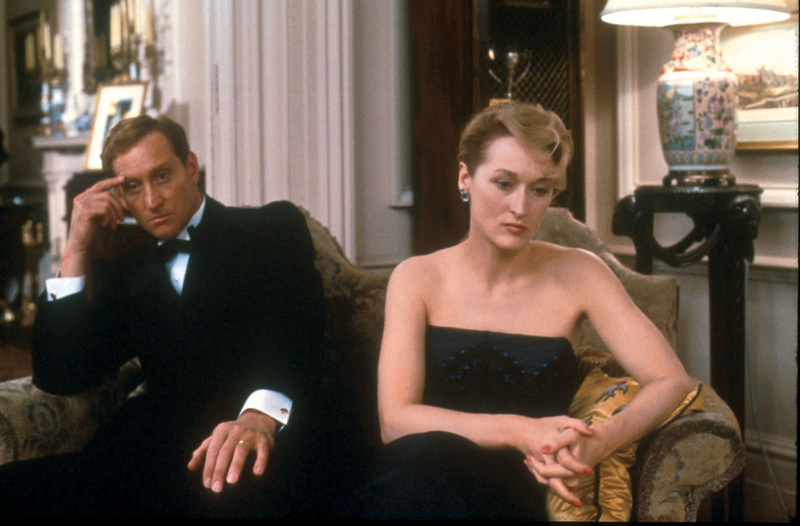 This entry was posted in Film Reviews and tagged Charles Dance, David Hare, Film Review, Fred Schepisi, Meryl Streep, Plenty on September 3, 2014 by Flo.